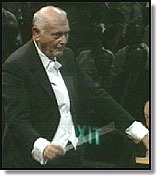 The death has been announced of the conductor, Sir Georg Solti. He was 84, and died suddenly while on holiday in the south of France. Sir Georg had shown little sign of reducing his activities, and was to have conducted in London at the end of next week. His career spanned the era of the early gramophone record to the compact disc, and from old-fashioned Central European maestro to the marketing of the modern-day superstar. Born in Budapest in 1912, Solti began his career as a pianist before making his conducting debut at the Budapest opera in 1938. He spent the second world war in Switzerland. He had been studying under the great Italian conductor Arturo Toscanini when war broke out. As a conductor untainted by association with fascism, Solti quickly became one of the most sought after of the post-war generation. In 1961 he came to London as music director of the Royal Opera House at Covent Garden. He became a British citizen and was knighted in 1972. In the opera house Solti's bald head and demanding rehearsal style earned him the nickname, the screaming skull. He could be merciless in his treatment of musicians. He said he just wanted the highest standards. In recent years, spent as the chief conductor of the Chicago Symphony Orchestra, he said that he had mellowed. Whatever his methods, audiences, critics, and buyers of his recordings, loved the results. A Solti concert, opera performance or recording was always a special occasion for musicians and listeners alike. He had showed no sign of slowing down, maintaining a busy diary right to the end. He was to have conducted Verdi's Requiem in London next Friday. As always the concert was sold out weeks in advance.